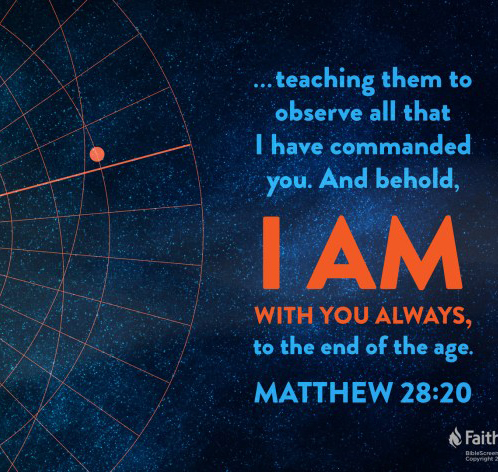 When Jesus says these words in Matthew 28, he’s about to leave his disciples, and leave his life’s work in their hands. He wants them to know that he trusts them, has important work for them, and that his Spirit will never leave them. He’s with them. He wasn’t even promising just to be them as a group, but was saying that he would never truly leave the world. His Spirit and love would be with his followers as they went into the whole world. Jesus would be there, even if it doesn’t seem like it sometimes, he’s there. 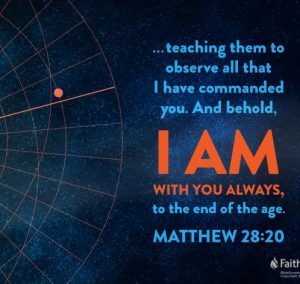 That’s one of the things at the center of Christian faith – that Jesus’ Spirit is alive and working in the world, in and through and around those who follow him, bringing life in the midst of suffering and death. If I stop and think about it, it’s those times when I wish Jesus wasn’t with me, that I most need him to be. When I’m at my worst, I need Jesus the most, and he is there. That’s true not just for me as an individual, but for groups and communities and nations and our world — when we most need Jesus’ Spirit, he is there working, even if we can’t easily see it at the time. One of the main ways he works is through the work of our hands. In this passage, Jesus says, “Go….and I will be with you.” Go and pray, worship, reach out to the one who is hurting, express kindness, relieve suffering and pray. And tell about what Jesus has done and is doing for you, bringing hope and life, and always there.